Model is 190cm, wearing size-L. If you want to make the Women's Size or Custom Jacket, please contact me!!! 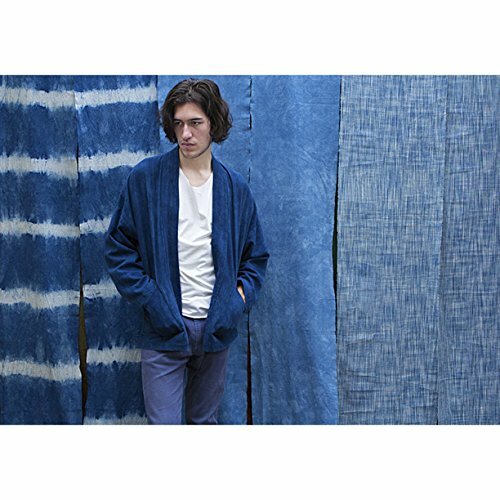 This IndigoAdult( Unisex) Kimono jackets/ Coats hand made in Thealese, which using natural Indigo dyes and natural fiber fabrics! And They are dyed with absolute precision using Chinese tie-dye and Janpanese shibori technique. Please wash separately before use, and for a few washes as Indigo may rub or stain other fabrics if left touching them while wet. Our products require a little love to take care of them, please hand wash in warm water! Please note due to different dye vats and technique variations your Cotton Fabric may look slightly different in colour and pattern to the one shown. Please allow 5 to 7 days for production from the order date. If you have any questions about this product by THEALESE, contact us by completing and submitting the form below. If you are looking for a specif part number, please include it with your message.